If you are visiting downtown Philadelphia, SEPTA (the acronym for the Southeastern Pennsylvania Transit Authority) is often your best bet for getting around. This is true for locals as well as visitors - parking is at a premium in Center City, and the vast Regional Rail, bus, "el" and subway system will likely get you to your chosen destination more quickly and inexpensively than if you took your car. 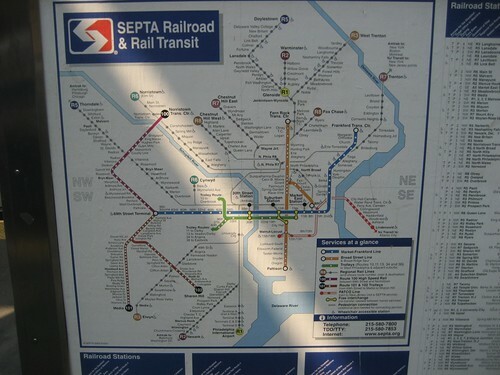 This particular page is written on the assumption that the reader has no previous knowledge of the SEPTA system. So if you're from the Philadelphia region, you might find this information to be something with which you're already familiar. But many native Philadelphians, especially if they are used to driving, aren't completely familiar with all the ways SEPTA can benefit them, as they move around the city and region. So please give it a chance, and perhaps you might find some information that is of benefit to you. There are two main rapid-transit lines in Center City - the Blue Line, which runs along Market Street (east/west) , and the Orange Line, which runs along Broad Street (north/south). The Blue Line's official title is the Market/Frankford Line, as it eventually leaves Market Street, and travels up Frankford Avenue into the residential neighborhoods of the "river wards". However, nearly everyone in the city refers to the Blue Line as the "el", short for "elevated train". So if you need to ask anyone how to get to a Blue Line stop, it probably would be best for you to ask them where the "el stop" is. There is an understandable point of confusion here, particularly if you are from out of town. The Blue Line, in Center City, isn't "elevated" at all - in fact, it's a subway! The counterintuitive name stems from the fact that the "el" does, in fact, become elevated, as it leaves University City into West Philadelphia, as well as on its journey up Frankford Avenue. However, for its subterranean trips through Center City and University City, a more accurate term would be the "Market Street Subway", so think of it that way. If you are traveling from Norristown, King of Prussia, the Main Line (including its college campuses) or the inner-ring suburbs of Delaware County, the Norristown High Speed Line - known for many years, up until September 2009, as the Route 100 Trolley - takes you from Norristown Transportation Center, through King of Prussia, Radnor, and eventually to 69th Street Terminal, where you can connect directly with the Blue Line, without leaving the station. The Orange Line, officially known as the Broad Street Line and/or the Broad Street Subway, is better known simply as "the subway". Unlike the Blue Line, it really is a subway for its entire route, from North to South Philadelphia, through Center City. Broad Street is the spine of the city, which is why the Orange Line was constructed along it. If you are from out of town, the subway is most likely your best bet, if you are attending a sporting event (or a concert, etc.) at one of the large sporting venues in South Philadelphia, which is several miles from Center City. The reasons being, the three miles are far too long to walk, and bus service, although it exists, is too slow, due to all of the lights and traffic congestion, especially during an event. In contrast, the subway trip from Center City - from either City Hall or Walnut/Locust Stations - to the Pattison Station is only about 10-12 minutes. All of the venues are an easy walk from the Pattison Station. However, if you aren't attending an event down there you probably won't need to use it otherwise. Buses, the PHLASH, or the Blue Line will be your most likely way of getting around downtown. You can find everything you need to know, in our SEPTA Regional Rail Guide. You can return to the Home Page of Enjoying Philadelphia, by clicking here.